Ships from and sold by Skinomi. Smart and active for nature’s biggest adventures! Equipped with a full complement of outdoor features to handle conditions across a wide range of activities, along with a wide array of functions which adds depth and breadth to outdoor life when connected with a smartphone. In the Timepiece Mode, the monochrome LCD becomes a dedicated timekeeping display. Communications functions and the color LCD are OFF*, reducing energy consumption for extended outdoor uses such as mountain hut trekking. 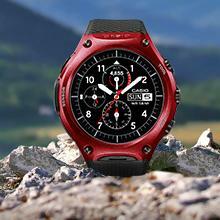 The Smart Outdoor Watch serves as a normal timepiece. Smartphone with Android 4.3 or later iOS. (Limited functionality when connected to iOS device). 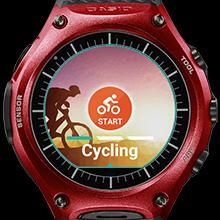 The WSD-F10 is the first smart watch with a built-in microphone to achieve 50-meter water resistance. Its water-resistant structure assures protection against wet conditions encountered in various outdoor environments, from sudden showers during mountain ascents, to sweat while cycling, to submersion while fishing or water spray kicked up from boating. The WSD-F10 realizes environmental performance in compliance with the MIL-STD-810G military standard endurance tests specified by the U.S. Department of Defense. This ensures its ability to withstand dropping shocks, vibrations and other demands of rugged outdoor use and to operate normally in a wide range of environments. Simple activation of the TOOL button gives users access to the information they need. 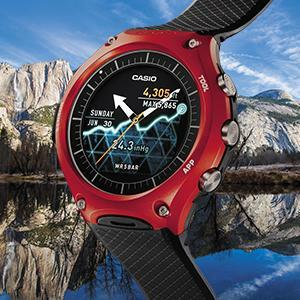 You can compare altitude readings produced by the watch with map altitudes to get a rough idea of your current location, which is a technique that is well-known to trekkers. When descending a mountain, you can check the angle of the graph to get an idea of your pace and your past progress to determine how much further you have to go. Real-time notification of changes in conditions. Information on factors such as speed, distance, elapsed time and changes in atmospheric pressure are displayed continuously during ongoing activities. Automatic notification of important information based on preset conditions during activities. 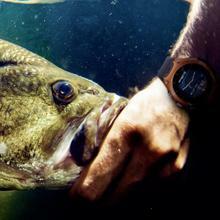 Whether the moment the sun sets or the best fishing time, optimal activity times never slip away unnoticed. 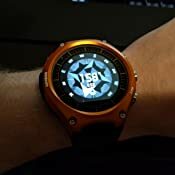 1.0 out of 5 starsTERRIBLE WATCH, TERRIBLE CUSTOMER SERVICE. Casio sent me a $965.57 bill to repair a $400 watch!! 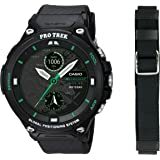 DO NOT BUY THIS WATCH, CASIO DOES NOT STAND BY THEIR PRODUCT AND IT IS ABSOLUTE GARBAGE. I bought this watch a little more than a year ago and immediately started having problems with it. I called customer service several times to try and fix it and each time I called they told me that I should start with the "easy" fix (i.e. a new cord, cleaning procedures etc) rather than return it for service. Finally after several months with a broken watch I sent it back for service. Casio sat on the watch for two months, without any updates. I had to call several times and they never had any idea what the status was. Finally, after two months of this I was told that they have "recreated the problem" and that the watch was broken and needed a "new module" but they could not actually tell me what was wrong with it because the watches are "sealed". 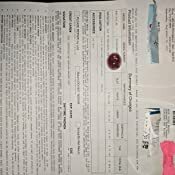 In case that was not bad enough, even though this problem started in month 6 and I had called multiple times about the same issue (and they have a record of this), they are are refusing to honor the warranty, claiming that because I did not sent the watch in before 1 year (based on their advice to try the "easy" fix first) I will have to pay for all repairs to the watch. I argued that this was complete none-sense but they said there was "nothing we can do". Then, to top it all off, they finally sent me the bill to repair the $400 watch and fix the "module". I have attached a copy so that no one can accuse me of making this up. Casio sent me a $965.57 bill to repair a $400 watch!! The other option is to not repair the watch but then I have to pay a "shipping and handling" fee to have my watch returned to me!! This is the absolute worst service I have EVER received from a company. DO NOT BUY ANYTHING FROM THESE SCAMMERS!!! YOUR WATCH WILL NOT LAST A YEAR AND THEN THEY WILL CHARGE YOU TWICE AS MUCH TO FIX IT!!!! BOYCOTT CASIO!!!!! 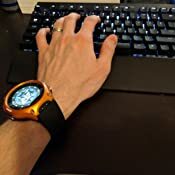 5.0 out of 5 starsHands Down Favorite Smartwatch! 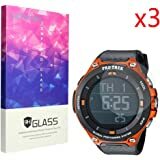 Best of both worlds (real and smart watch)! See the bottom of this review for a 1 AND 3 year update! This is my second smartwatch. First being my Moto 360 (1st gen). 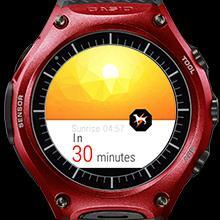 This watch is leagues better in performance and features. My watch before that was a Casio tripple sensor pathfinder (the watch this one is based off of). 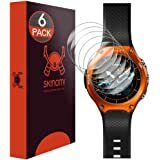 I highly recommend this watch as a it not only is the best smartwatch I have tried but is the first smartwatch that doesn't make me miss my old Casio. - Fully waterproof. Showered and swam with it, no issues. - True always-on screen mode. - Long battery life. 20 hours with always-on screen mode. - Timepiece mode. Can boot into normal LCD dumb-watch mode for 30 days of battery life (advertised not tested). - Fastest watch used/seen yet. Very responsive. - Dedicated buttons. App button is customizable app launcher through Casio android phone software. 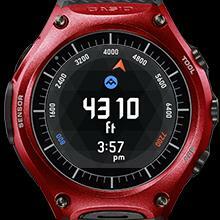 - Exclusive tools (Altimeter, compass, step counter, sunrise/sunset, tide graph, barometric pressure) are amazing, sensitive and very responsive. - Comes with Android Wear Marshmallow (1.4) preinstalled using my Nexus 6P. - Microphone is accurate and responsive. - Haptic feedback is strong. - Charging is quick (less than 2 hours for full charge). Magnetic charger is a nice touch. - Risen band is soft rubber and comfortable. - Military spec in various environmental conditions including shock and vibration. - Theater mode is the dumb watch/timepiece mode temporarily, not just the screen off. Pro tip: Put the watch in theater mode (double tap middle button) when showering, in rain or around water to prevent the water from activating the touch screen. The watch will still display time (just in dumb watch/timepiece mode), just not act like a thousand tiny fingers are swipping at your watch. Tap the middle button again to exit back to smartwatch mode. - No built in GPS. - No ambient light sensor. - No heart rate sensor. 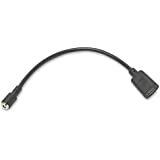 - Magnetic charger disconnects easily. 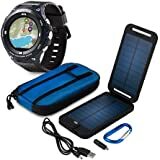 Cannot charge while still on wrist as it pops off quickly. - Water does activate touch screen. I work at a desk and run for fitness. While I am hard on my watches they do not see constant abuse from my lifestyle (mostly from carelessness). 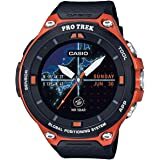 I purchased this watch because I love and trust the Casio brand and have used their watches for over 15 years. 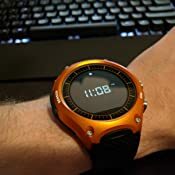 Once I went with a smartwatch I could not go back, this offers the best of both worlds; a real watch that is always on, I can wear all day and not need to take off for any reason (except at night to charge). This smartwatch actually last the whole day! That's with it always on (ambient mode watch faces though) and with me playing with it all day. The tools are really neat and I have had them on other Casio dumb-watches. I never use them but they are fun to show off and are accurate (at least previous Casio sensors were). Waterproofing and all-day battery while always on were the main selling points for me. I need a watch first, and a smartwatch second. This raises the bar as an actual watch while still being a superb smartwatch. The physical buttons are really nice since one of the main downfalls of a smartwatch is ease of use. It should take more than 3 clicks/swipes to get to what you want and most apps are more than that away. The Tool button and App buttons help alleviate this for the most used apps. The feature I miss the most is the ambient light sensor. 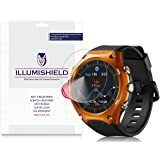 Finding a balance between being able to see the watch outside (especially with sunglasses on) and not have it blind you in low light settings is difficult with this watch. The flat tire is annoying sense there is not light sensor, but honestly you do not notice it after a few days. The watch is very lightweight, feels like its aluminum rather than titanium as a lot of the G-Shock Casio watches are made out of. Band does appear like it could be replaceable, but I have not seen any third party bands yet. Lack of GPS and heart rate monitor are no big deals to me. I will never be without my phone and the heart rate sensors are a joke. You need to stand still for them to work properly and while you're working out is not when you want to stand still. I cannot attest to the durability of this watch yet, but it has no scratches yet and the screen is deeply embedded so only a corner of something should catch the screen. See attached video for size and features. I am a medium to slim build guy, 160 lbs 5'10". This watch continues to be a reliable and valuable replacement for my everyday dumb watch with all the features Android Wear. I do not have any problems and it is well intact. 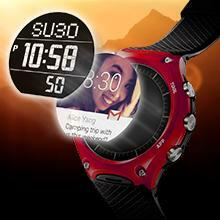 - Using the watch with always-on screen turned off seems to be the sweet spot for the watch. It lasts two days in battery, and when the screen is off, Casio provides much more than the ambient mode of most watch faces. You get time with incrementing seconds, plus the day and date. It saves battery and is a better ambient face. Definitely recommend turning off "Always-on screen". - the watch does occasionally become disconnected from the phone. A quick was to fix this is to cycle the watches airplane mode; turning airplane mode on for a few seconds and then turning it off seems to allow the watch to connect again. You may need to open Android Wear on the phone as a last step to connect the two again. This seems to occur most when I have been away from the phone for a while. - The watch is easily scratched, especially if you work with your hands. I recommend taking it off if working inside the engine of a car or other tight metal places as it will bang up the aluminum face and screen. A screen protector is a must! Within the first week I would have gauged the watch screen real good. This is not Gorilla Glass nor is the face made of titanium, get it some protection! - I have read that others have issues charging the watch after some time. I have noticed this when there is small bits of metal or debris in the charging section of the watch or cable. This can happen easily as it is magnetic. Clean it out and it works great! This watch is still going strong! After 3 rough years with it, it still lasts 36 hours easily. Charges fast and works smoothly. Supports the latest Android Wear/Wear OS (third/latest major update). If I had one complaint it would be that it does not always charge at night and I wake up to it being at 30% charge. It will still last most of the next day, but it only takes 30 minutes of charge to get in the 80s and I'm good to go! Most of the metallic finish has come off, but the base orange layer is still looking great. This watch can take a beating and still truck on. 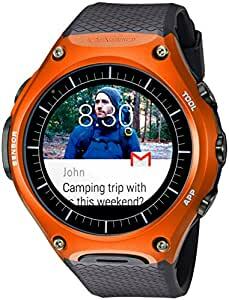 All in all the watch is still quick, water proof, and has long battery life. I still am wearing it everyday and still recommend this watch above all others!